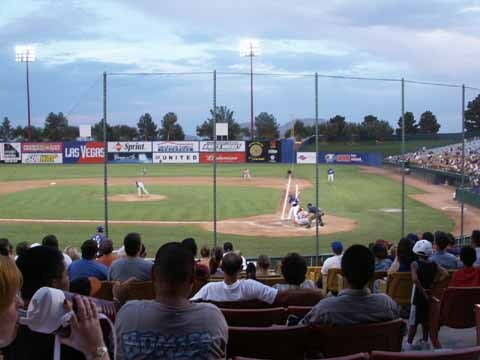 We visited the Las Vegas 51s for two games. 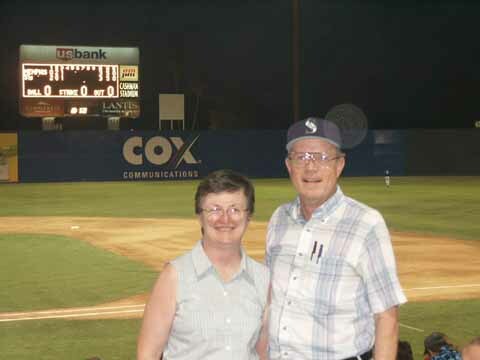 They were playing the Memphis Redbirds who we just saw in Tucson. 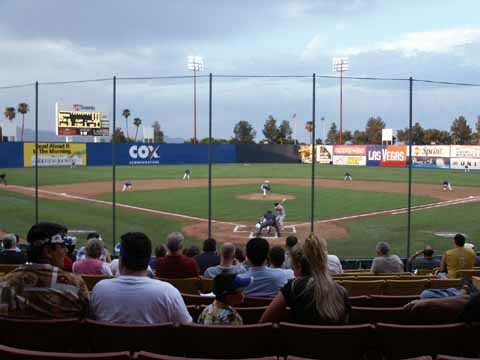 The 51s are affiliated with the Los Angeles Dodgers. When we went to get our tickets in the afternoon the computer was down, so we had to stand in the very hot afternoon heat for over 15 minutes. Because of this we got both nights of tickets free. The first night was Thirsty Thursday with $1 10 oz. Budweiser beer. They have a bottled beer called Alien Lager. 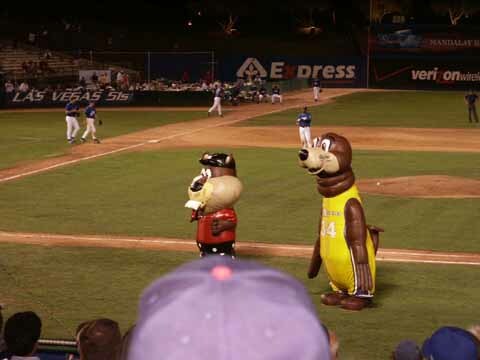 The second night was ZOOperstars. 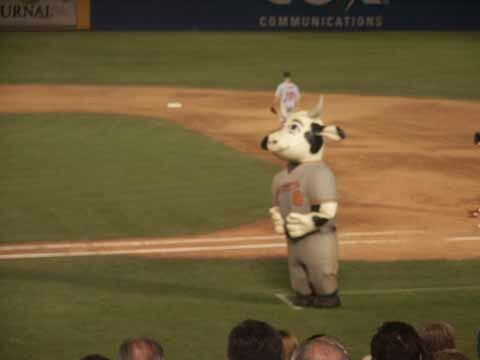 The ZOOperstars consisted of Harry Canary, Cow Ripkin Jr. Clammy Sosa, Tiger Woodschuck and Shaquille O'Seal. 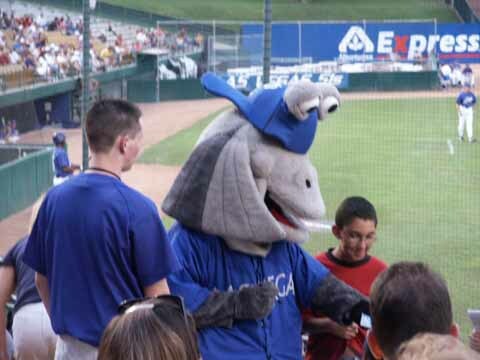 Harry sang "Take Me Out to the Ballgame" and Clammy ate a ballplayer, spit out his clothing and finally spit out the player in his yellow undershorts. 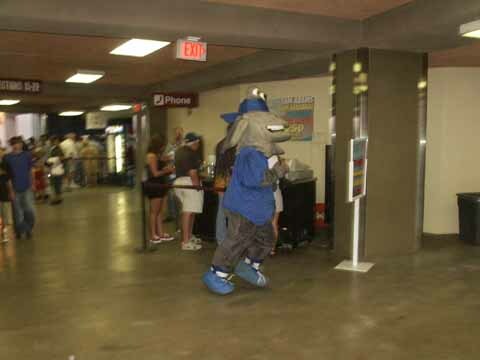 Cosmos is the mascot and is billed as the only living thing to escape from Area 51. 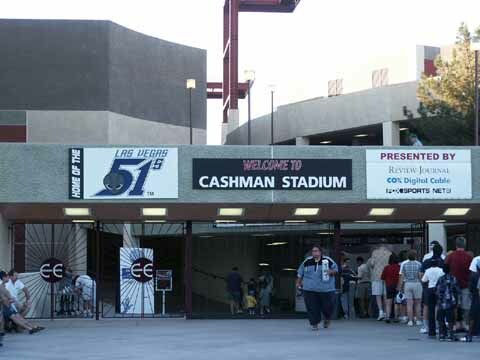 Cashman Stadium was built in 1983 and seats 9,334. 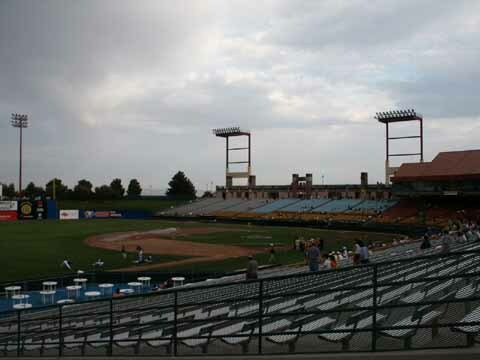 It has more bleacher seating than do most of the fields we have seen that were built in the same era. The temperature started at 109 degrees and ended at 99 degrees both nights. 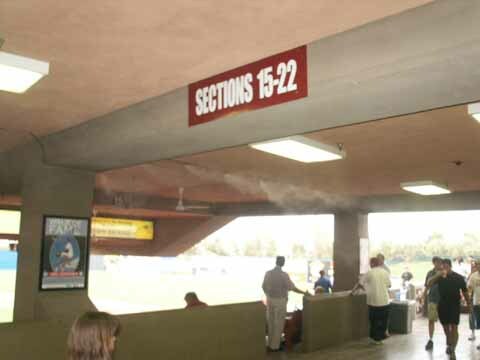 Until the end of the 7th inning Thursday they had misters running above the seats in the covered area of the stadium. You can see them in one of the pictures. 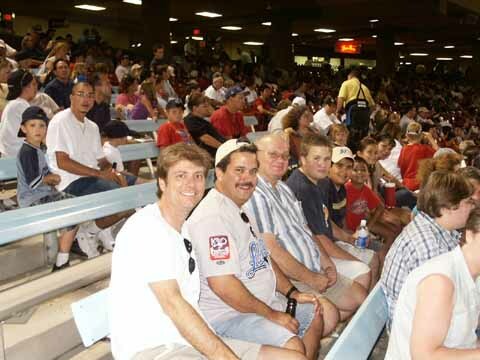 The two families shown were sitting behind us and we talked with them during the game Friday. 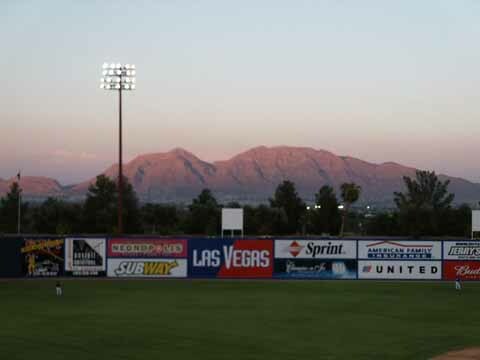 The mountain is viewed from the Club Level on the third base side. 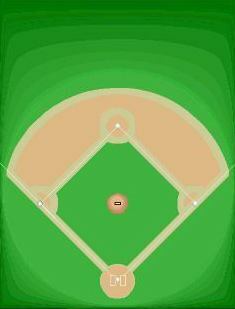 The field lines are RF & LF - 328', CF-433', and RC & LC - 364'. This is the deepest CF we have seen. 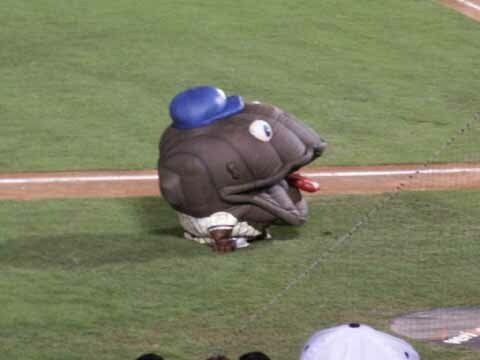 On Thursday the 51s beat the Redbirds 10-2. 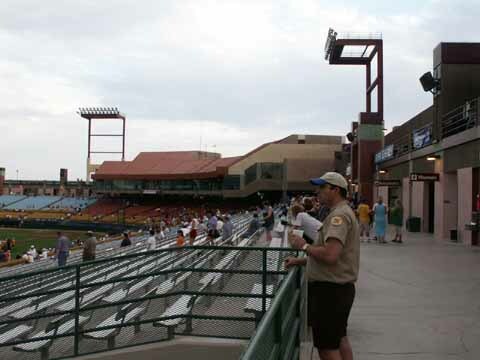 The box score was Redbirds R-2, H-9, E-0 and 51s R-10, H-14, E-1. 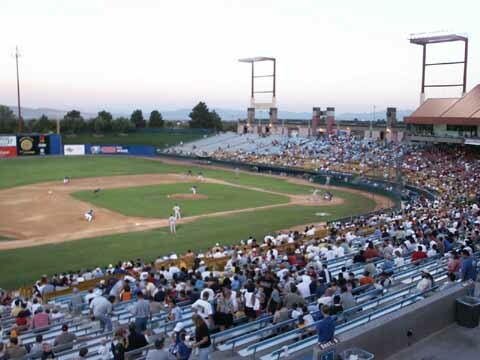 The attendance was 5,179. 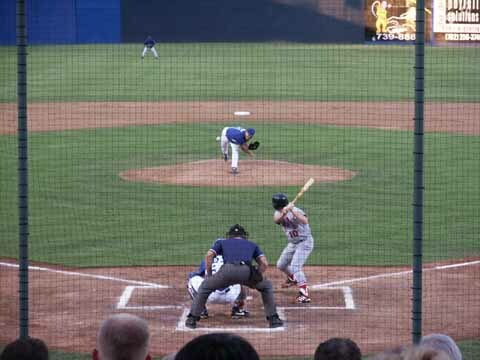 On Friday the Redbirds beat the 51s 10-8. 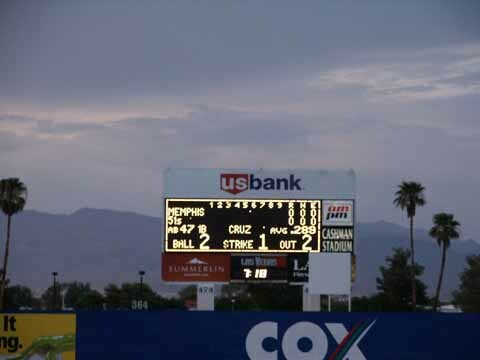 The box score was Redbirds R-10, H-17, E-0 and the 51s R-8, H-14, E-1. 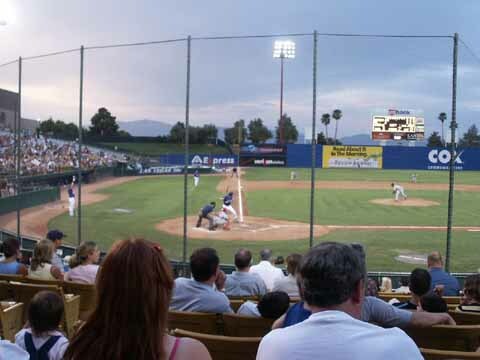 The attendance was 7,855. 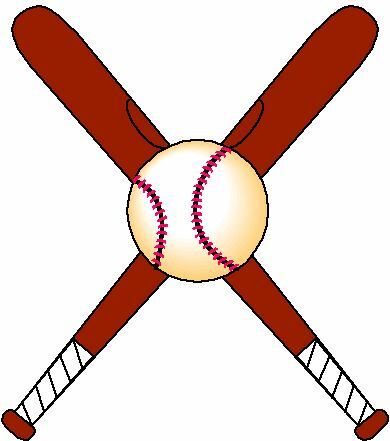 2009 affiliated with Toronto Blue Jays.